A lot has happened since The Lego Movie activated our nostalgia sensors back in 2014, including—but not limited to—writer/directors Phil Lord and Chris Miller getting nominated for an Oscar and star Chris Pratt getting into Biblical dieting. 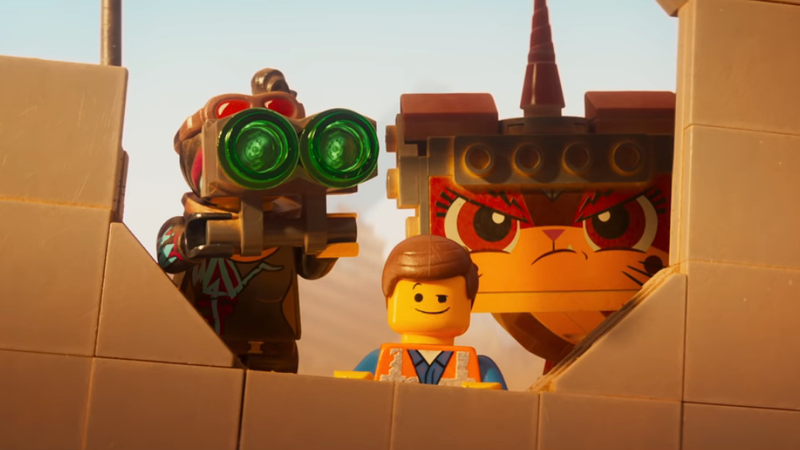 That last bit’s kind of weird, but not weird enough to keep us from checking out the sequel, The Lego Movie 2: The Second Part. Lord and Miller return as writers on the project, directed by Mike Mitchell (Trolls, Alvin And The Chipmunks: Chipwrecked); most of the original voice cast is back as well, alongside some delightful new additions like Tiffany Haddish, Richard Ayoade, Stephanie Beatriz, and The Florida Project star and 8-year-old film director Brooklynn Prince. And if you happen to live in Chicago, we’ve got an opportunity to bundle up and brave the cold this coming Saturday, February 2, when we’re hosting a screening of The Lego Movie 2: The Second Part at the AMC River East (322 E. Illinois St.) at the kid-friendly hour of 11:00 a.m. To claim a pair of passes for yourself, simply follow this link and enter some basic information. Just remember to arrive early, as advance screenings are intentionally overbooked to ensure capacity and there’s nothing awesome about being left out.